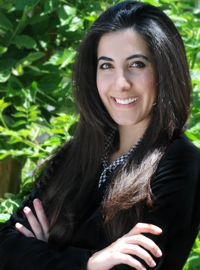 My guest for this episode is Nicole Aboud, an attorney practicing Fashion Law in Los Angeles. She works with fashion designers and companies to set up their business entities and protect their brands. Nicole graduated from Southwestern Law School in 2011. She remains heavily involved in her law school’s young alumni organization, the Arab American Lawyers Association of Southern California, and the American Bar Association. In her downtime, Nicole trains for half marathons, volunteers at legal clinics and other community organizations, and hangs out at her local public library. But we're here to talk about podcasting. When she’s not lawyering, you can find Nicole chatting with awesome millennial attorneys on her podcast, The Gen Why Lawyer Podcast. Nicole’s guests range from attorneys who are finding great success in their legal careers to young attorneys who have decided to pursue alternative non-legal careers to find happiness. Through her podcast, Nicole hopes to inspire professionals to shake off their fear of being unconventional and embrace their unique voice. Looking for more ways to market your law practice? Do you want more, better clients and referrals? Check out our free video series that shows you a proven, 6-part strategy for using modern media tools to leverage your marketing.